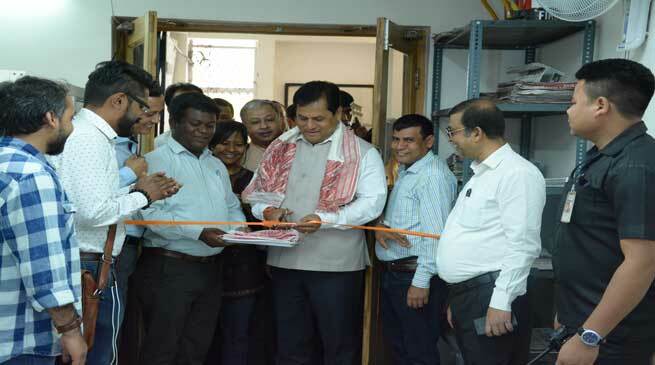 Assam Chief Minister Sarbananda Sonowal inaugurated the newly set up Press Lounge at Assam Information Centre at Baba Kharak Singh Marg on Sunday . Addressing the Assam media persons based in New Delhi, Chief Minister Sonowal exuded the optimism that they would continue to work with renewed zeal and vigour in the greater interest of Assam and its people in the days ahead. “I am happy that a long felt demand of the media persons of Assam based in Delhi has been fulfilled with the coming up of the Press Lounge in the national capital. They will be able to disseminate news report to the people smoothly,” he said, adding that the present Government could set up the Press Lounge with the support and cooperation of the media persons. Sonowal urged the media persons to work for fulfillment of the hopes and aspirations of the people living in Barak-Brahmaputra valleys and in hills-plains. “The media persons have a pivotal role to play in fulfilling the hopes and aspirations of all sections of people of Assam and they must unitedly and resolutely work for their greater interest in the coming days,” he added. On the plea of media persons to make the lift lying defunct for several years into operation, the Chief Minister called up the Managing Director, Assam Government Marketing Corporation, Anjan Sarma to take immediate steps for the convenience of media persons and tourists coming to the Emporium complex and Tourist Information Centre. President, North East Media Forum, Utpal Borpujari thanked the Chief Minister for taking prompt initiative in setting up the Press Lounge for the convenience of media persons of Assam based in the national capital. Earlier, the Chief Minister was felicitated by Incharge Deputy Director, Assam Information Centre, Sabir Nishat, General Secretary, North East Media Forum, Asish Gupta and other members. Resident Commissioner, Rwitticka Kalita and Deputy Resident Commissioner, Joydeep Shukla were present on the occasion.